For $5,000 to $10,000, high-end chefs will have a new toy and tool later this year—a 3D printer specializing in sugar. 3D Systems’ ChefJet series can print monochromatic or full color shapes to adorn cakes and other edible works of art. The machines will come in two sizes, one to fit snugly on a countertop and another larger printer with more accommodating print size and color printing capability. 3D Systems will include its Digital Cookbook software to make design easy for chefs not familiar with 3D modeling software, and the sugary materials will come in a variety of flavors like sour apple, watermelon, and chocolate. The printer uses water to moisten the sugar for printing and alcohol to harden it once in place. Finished designs make for high-end cake toppers, fancy sugar “cubes,” and artistic, edible centerpieces. This isn’t the first time 3D printing’s gone foodie. NASA’s funding a 3D pizza printer for space, and Google prints pasta. Even sugar’s been a 3D printing medium, used to build vasculature in experimental 3D printed organs. Don’t expect 3D printers to sit next to toasters just yet, however. The ChefJet is clearly priced for professionals. That said, they may eventually offer future sugar printers for amateur kitchens—which is where this particular printer was conceived in the first place. The firm didn’t build the tech entirely in-house—they bought it from a cute young couple, Kyle and Liz von Hasseln. Legend has it the the von Hasselns, still in school, wanted to bake a cake for their friend’s birthday party, but they didn’t have an oven. So, naturally, they decided to 3D print the cake. It wasn’t the simplest or most direct path, but it did eventually lead to a good method for 3D printing sugar and in early 2013, the von Hasselns started a firm, Sugar Lab. 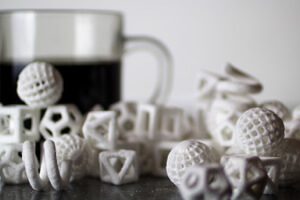 Not long after, they attracted the attention of 3D Systems, one of the biggest players in 3D printing, who subsequently bought Sugar Lab in late 2013. Centerpiece 3D printed with sugar. 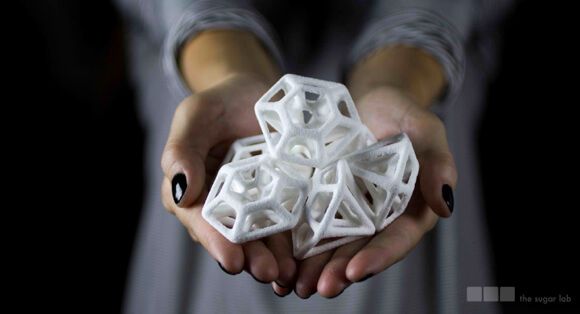 3D printers are capable of working with a lengthening list of materials and finding applications beyond manufacturing. 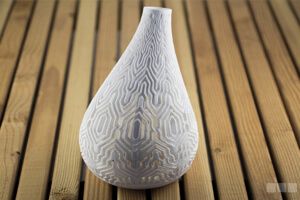 Indeed, more user friendly software, like the Digital Cookbook, is extending 3D printing’s reach to more people. And whereas 3D printers got their start in rapid prototyping, one of the first new commercial areas they’ve expanded into is art, particularly jewelry. Art and food have a long history, and the von Hasselns saw the potential for 3D printing to make beautiful new custom creations for the likes of cakes and other desserts.